Interstate 378 was the original designation for the freeway connecting U.S. 22 (Lehigh Valley Thruway) near Lehigh Valley International Airport (ABE) with Downtown Bethlehem. Designated Pennsylvania State Route 378, the short spur winds southeast from the Westgate and Notre Dame Hills neighborhoods to the Hill to Hill Bridge spanning the Lehigh River. Interchanges along the route are numbered sequentially and increase from north to south. The Bethlehem freeway spur was constructed between 1966 and 1968.1 The route was signed as I-378 until the proposed realignment of Interstate 78 south of Allentown and Bethlehem was finalized. The American Association of State Highway Officials (AASHO) approved the elimination of Interstate 378 and the adjacent Allentown Spur (I-178), on June 30, 1970. I-78 was subsquently dropped from the Lehigh Valley Thruway, which remains as U.S. 22. The former I-378 was renumbered as part of Pennsylvania 378, a 9.55-mile long route stretching south to Pennsylvania 309 in Upper Saucon Township. Interstate 378 was also previously proposed to extend south across the Lehigh River to an interchange with a separate planned freeway: Constitution Drive to the west and South Side Spur to the east. The South Side Spur was projected to go east and south to the realignment of I-78. Interstate 378 under construction in 1968. The signing of Pennsylvania 378 would later replace Pennsylvania 191 south from the Hill to Hill Bridge to University Heights and Wydnor. Traffic separates for U.S. 22 to Easton and Allentown at a trumpet interchange a half mile north of the Catasauqua Road overpass. Photo taken 09/01/05. The eastbound on-ramp from the end of Pennsylvania 378 joins a collector distributor roadway to adjacent Schoenersville Road. U.S. 22 (Lehigh Valley Thruway) runs between Allentown and Lehigh Valley International Airport (ABE) west to I-476 (PA Turnpike) at South Whitehall Township and I-78 at Upper Macungie Township. Photo taken 09/01/05. Entering the city of Bethlehem, an auxiliary lane opens east from the exchange with PA 987 to the trumpet interchange with PA 378 to Downtown. Photo taken 09/01/05. U.S. 22 (Lehigh Valley Thruway) eastbound reaches the collector distributor roadway for both the PA 378 freeway spur and Schoenersville Road at Westgate Hills. Photo taken 09/01/05. 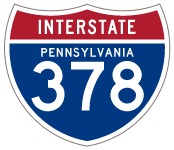 The southbound ramp for PA 378 freeway departs U.S. 22 east for Bethlehem and Lehigh University. Photo taken 09/01/05. Right in right out (RIRO) style ramps join PA 378 southbound with 3rd Avenue to Broad Street and Downtown Bethlehem. The freeway concludes in a half mile. Photo taken 09/01/05. Interstate 378 ended at the at-grade intersection joining the north end of the Hill to Hill Bridge with Spring and Main Streets. The ramp west to Spring Street permanently closed. Photo taken 09/01/05. The Hill to Hill Bridge spans Lehigh Street, the D & L Trail and the Lehigh River south to Brighton Street. Photo taken 09/01/05. The Second Street Ramp links the south end of the Hill to Hill Bridge (PA 378) with PA 412 (3rd Street) east. PA 412 arcs southeast to I-78 at Hellertown and ultimately PA 611 near Nockamixon State Park. Photo taken 09/01/05. Locally known as the steel bridge, Pennsylvania 378 crosses the Lehigh River on the Hill to Hill Bridge north to Main Street. Interstate 378 began at the turn off for Main Street to Downtown Bethlehem. Photo taken 09/01/05. Northbound Pennsylvania 378 reaches the Main Street off-ramp and freeway beginning. The initial stretch of old I-378 lines a restoration area and greenbelt along Monocacy Creek. Photo taken 09/01/05. Pennsylvania Highways: Pennsylvania’s Decommissioned Interstates.